Although not a busy weekend for camping, there was lots of work to do due to a few day visits from groups on the Sunday. The largest group was from local bus company Stagecoach, whose drivers had organised their annual family fun-day for around 200 people. Arriving early on sunday morning, some of the members of their organising committee spent the whole morning setting everything up for the rest arriving, assisted by the Fordell staff. 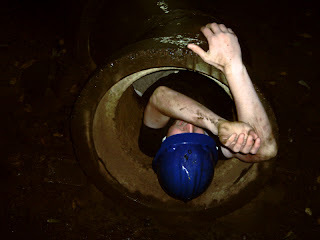 Above : Challenge course - participants crawl through a pitch-black tunnel for 20 feet and are then dazzled by an annoying man with a camera and flashgun. 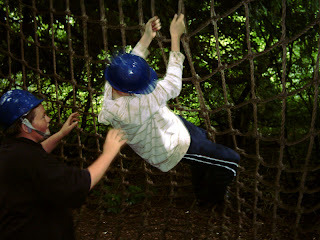 Lots of activities were set up including grass sledges, soft play area, volleyball and a slippery slide. After extensive testing by the adults (just to make sure they were safe of course), everything was ready...except for the bouncy castle. Due to a mysterious power problem with the generator, it wasn't possible to inflate the castle so Bob and the staff tried to rescue matters with a monster collection of extension leads and safety circuit breakers which were run round the perimeter of the whole main site back to one of the accomodation buildings. One hour later, the leads were all set up but still no power! Despite numerous checks and re-checks, it was decided that it would be easier to use Fordell's own bouncy castle in the wet weather hall, especially as it was starting to rain a bit. Despite heavy rain in the afternoon, there was a good turnout for the funday, with the adults sitting under shelter and the children oblivious to it all, enjoying the slippery slope and other activities. Some of the bus drivers spent the whole afternoon manning a barbeque to make sure that everyone had enough hot food and drink. Above : The traverse net - a collection of holes tied together with rope. Sunday afternoon also saw a flying visit (:->) from an Air Cadet group from very far away up north, who had been at the Edinburgh Tattoo and had popped in to take part in a few activities. Despite getting thouroughly muddy everyone seemed to enjoy themselves, although some who had forgotten to bring spare clothes were forced to borrow clean clothes/binbags/anything from others before they were allowed back in their clean minibus. 5pm and the site was back to being fairly quiet again for a few days, hopefully giving the grass a chance to dry out a bit before the next lot of visitors arrive again.